Christy at Tiddly Inks has outdone it again, bringing us several new images to swoon over! You gotta get your hands on these. They are gorgeous! Here's my latest Fabby Friday make using Reindeer Games. I will also be entering this card into the Christmas challenges mentioned at the end of this post. These new releases have definitely gotten me into the Christmas spirit! I distressed some of the layers before blending on mowed lawn and forest moss distress inks to the edges. The scalloped layer is popped up with foam tape. The sentiment tags swing freely and are attached with black twine. You definitely need to get your hands on these new images here. Thanks for stopping by! 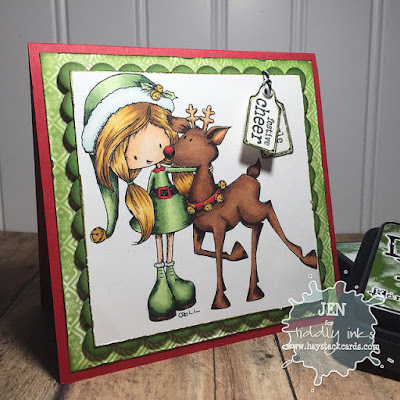 Update 11/30/15: I'm so excited to find out my card was selected as the MarkerPop challenge winner!! This is so sweet! Adorable card with beautiful coloring! 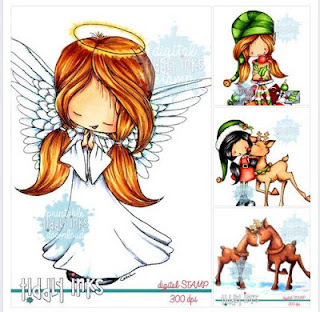 Thanks so much for playing along with us over at the Simon Says Stamp Wednesday Challenge Blog! Lovely card! Those little tags are so cute. SUCH an adorable card!! Awesome coloring! Thanks so much for joining us at MarkerPOP for our Hanukkah/Christmas Challenge!